and feedback that I have received over time challenging some of the ideas. It was good to get confirmation from another source, about the viability of holding leveraged instruments for the long run, something which is constantly demonized by financial talking heads. Yes, there are risks, but the clever mixing of leveraged ETFs demonstrably reduces portfolio volatility and draw-downs while improving returns throughout entire market cycles. 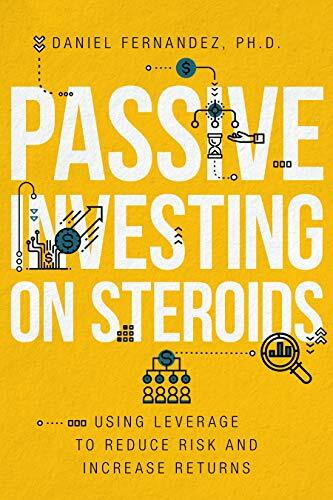 In the book, the author explores leveraged approaches to long term investing, first using non-leveraged instruments while utilizing margin capital and paying interest. Then he contrasts that approach vs using leveraged instruments (which have a slightly larger management fee) and avoiding margin interests. One thing that I missed in my series was the usefulness of short-term Bonds. Passive Investing on Steroids explores this subject, arguing that short-term treasuries provide better protection during increasing interest rates environments. I only went with long-term 20 year treasuries in my own series, but in an environment like the one we had in 2018, with rates increasing, short-term bonds suffer less than long term bonds. Because we don't know the general movements of rates decades in advance, it makes sense to hold a mix of both short-term and long-term treasuries, to be better protected against Interest Rates fluctuations. Some readers have put into question the use of ZIV in my leveraged portfolio, fearing a XIV like event that would result in the termination of the Etf. As I have explained, that event is highly unlikely for ZIV but I understand the fears. Daniel's book, in this case gives a great alternative for those that prefer to be more conservative. Simply mix a 2x leveraged instrument with 2x short term bonds and 2x long term bonds and you will have a solid combination to beat the markets while having smaller draw-downs. For example MVV/UBT/UST (one third of the portfolio on each) results in decent annual returns in the 14%-18% range with a maximum historical draw-down in the 14% range and a nice Sharpe Ratio of 1.30. Using leveraged equities combined with short and long term leveraged treasuries, you have entirely removed the Inverse Volatility (ZIV) component of the portfolio. The book also touches the topic of 'when to add to the portfolio'. Instead of adding capital at specific hard points (i.e. beginning of very quarter, beginning of every year, etc) it proposes to make the additions when the portfolio is at a certain draw-down point from its most recent peak. The results look pretty convincing in this case. I think the research made by the author, the statistics shown and the cleverness of his process explaining each step while formulating the portfolios is excellent and I recommend this book. Here's the link on Amazon. I'm not affiliated and don't make a penny off of this recommendation. I simply think it is great value and a good read.